TBILISI, DFWatch–Clean-up work in Dariali Valley in northern Georgia was resumed on Saturday, a day after workers were evacuated due to a risk of a new landslide. Seismologists registered microquakes in Devdoraki glacier, which the government’s experts said was the direct cause of a recent deadly landslide. Scientists feared that microquakes could cause another landslide and gave orders to clear the valley Friday. “Scientists gave advice to carry out preventive measures and evacuate workers from the valley. Now there is conducted intense monitoring,” said Nodar Nadirashvili, representative of the crisis management center. No-one is living in Dariali Valley, which left only workers to be evacuated. “Specialists observed the glacier from a helicopter. They noticed some deformations. However, due to the bad weather, we were not able to determine the scale of those deformations. 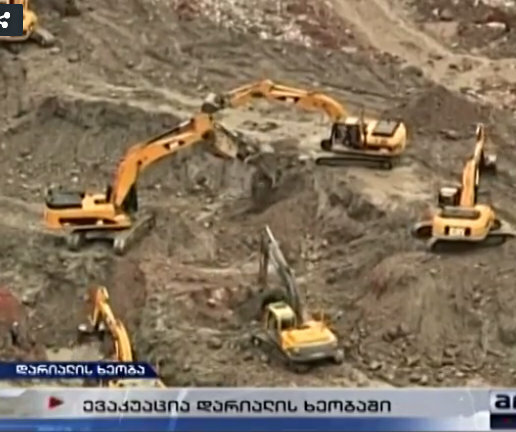 Neither hydrologists, nor geologists noticed any kind of movement of the solid rock,” Merab Gaprindashvili from the National Agency for Environment said to journalists. The government says that up to 170 people are working at the site of the May 17 disaster. Authorities do not yet have a complete overview of the extent of damage. “The damage is quite significant. Unfortunately, we have not got the final figures yet,” Economy Minister Giorgi Kvirikashvili said. According to the Regional Development and Infrastructure Ministry, a group of specialists are intensely observing the situation at Devdoraki glacier, which lies at over 5,000 meters height on Mkinvartsveri mountain, one of the highest peaks of the Eastern Caucasus.